Color theory can help you see why colors look good, and help you adjust them if they don't. 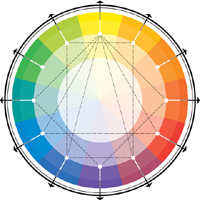 If you don't have a natural feeling for color, color theory can help you develop it. Color and values also are the main thing to learn when you want to paint realistic. Check here for some basics on this subject. There are two main sources of colortheory. Newton had a more technical approach, and provided tools for technical aplications (color TV). The other theory, by Goethe, approaches color with a good mind and the senses, it helps you understand the meaning and artistic effects of colors. The color itself, called "hue" - the main color, and its place in the color wheel (scroll down) . Then the intensity of this color, called "saturation" or "chroma"
last, the tone: extra colors mixed in as undertones, giving the "hue" its character. 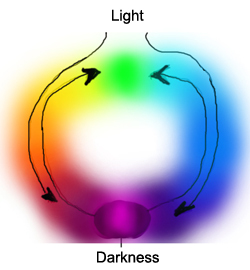 Colors interact optically. This happens in your eye (brain, perception) just the same as on an LCD screen. There are three laws to be found here (shading, contrast and interval). Additive and substractive mixing: Color can be both light and matter. This is reflected in the RGB and the CMYK system. Both have their own primary colors. The main thing in mixing paint is substractive (CMYK), it's about mixing matter. But to bring your colors to life, you need additive mixing laws (RGB) as well. Click here if you want to skip the info and start mixing colors. Texture: every material his it's own surface texture - smooth, velvety, grainy, rough etc. When you paint, you put layers over each other to imitate it. Underlying colors shine through. More advanced painters often create their own layering systems for this (check here for imprimature and underpainting ). Hue, or: what's this color? Above, you see different hues. On the left, there's a set of colors based on one hue (red). The red on the upper left is the "pure", prismatic one, The others were mixed (in photoshop) with black and white. All these shades are basically in one "hue". They're different because they have different saturation (intensity, some are more 'red' than others), and they have different tonal values (lightness and darkness, black and white added to them). Different values of one hue can be used for painting the side of a colored object that's in the shade, or to give it highlights. You also use to adjust a wall color to the kind of light it gets. The saturation (color intensity) is best adjusted to match those of the other colors in your painting or interior design - then things will have a balanced look. Check here for more basic color theory and color schemes. Due to these interacting factors, it can be hard to define a real-life color at all. In real life, colors are mixed not only with black and white, but also with other colors (undertones), and they have their own texture. So it might take some practice to define the main color of, let's say a sweater, at all. You can train it by using Photoshop, and of course too by looking around and defining shades of trees, people's clothes etc. In the field of interior and graphic design, practical tools have been developed to make color manageable. You find them in photoshop as well. Needless to say these tools are great for painting as well - they can help you manage your colors effectively in a short time. Check here for info on a good course for basic color theory. Still, to really understand color it's vital to realise that color can be both light (immaterial) and matter (material). Goethean color theory is great for that. When you paint, you mix material paints, but you also deal with optical laws. This is more advanced color theory, not necessary in the beginning but later on it's a real asset in bringing your colors to life. Most color theory is about the color wheel. When you put all colors in an orderly row (flowing into each other like a rainbow), they form a circle like the color wheel on the right. But this is an abstraction, a scheme, it's a handy tool to create some order in the color chaos - not the ultimate truth. Color wheels are a result of perceptions that were done with the help of a prisma. This is where you can see how color actually and physically is created. You'll find more about that here on this page. This color wheel is a regular one. The colors next to each other are shaded, they're just a little bit different from each other. The ones opposite from each other also look like opposites, they're totally different from each other, and form a contrast. One trick to make a harmonious color scheme is, take a color wheel, lay a triangle, a square or a rectangle on it, and take these three or four colors as a basis for further mixing. If you try it out, you'll see that it more or less works. This picture has the same colors, but it's more of a reflection of the way colors appear in a prisma. In a prisma, you see a range of blues (from turquoise to violet), that goes from light to dark. Also a range of warm colors (yellow, orange, red, carmine) from light to dark. Where the two light edges meet, you get green (which is darker than the other two). When the two dark sides reach over and meet, you get magenta: a brightening or a ligter color. Not all prismatic colors are equally dark. Yellow is a light color, and violet a dark one. With primary, they mean: colors that can't be mixed, and that you use to mix other colors. But in mixing colored light, you have really different primary colors then in mixing paint. Mixing light is done with RGB, and mixing paint or ink is done with CMYK. In painting you work with both light and matter - on an optical level, the RGB color laws have an influence as well. The terms Primary, secondary and tertiary colors come from a color theory that didn't include the concepts RGB and CMYK yet. Regularly, you find red, yellow and blue being called primary colors (I think Kandinsky is the source of this). This is a concept that's somehow spiritual, but doesn't make good mixing results - so in time I changed it over - Check here for a color mixing guide - based on both RGB and CYMK primary color systems, and taking into account that pure greens can be mixed more easily than pure reds. Check here for more advanced color theory on RGB and CYMK. Secondary colors can be mixed. But again, RGB secondary colors are different from CMYK secondary colors. In fact: when simplifying a bit, like the picture on the right, you can say that the primary colors of RGB are the secondary colors in CMYK, and vice versa. The ones with the black dot are the YMK-colors. In paint, yellow, is a primary color. You can't mix yellow, and you need it for making orange and green. But in stage lighting, it's a secondary color: you mix it with green and red light. The most common secondary colors in painting are: violet (mixed with magenta and blue), green (mixed with yellow and blue), and red (red can be mixed with yellow and magenta). Check here for a Color mixing guide with graphic examples. 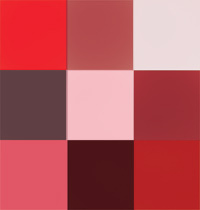 In this color list you'll find three shades of red, and no green, because greens can very easily be mixed and reds can't. But the list is based on the color theory on this page. These are the ones that are hard to define - the real-life natural colors. Browns, greyish greens, greenish violets, mustard greyish yellow etc. They're made with three or more colors. Tertiary colors look the most natural - most colors in nature and real life are tertiary. Most natural greens have hinges of red in it as well. The most important factor in learning color theory is: learning to see colors, in their hues and values. This is best learned with the help of some visual tools, though some have a natural eye for it. But with good study material (and excercises) anyone can learn to master the colors effectively. I was going to write an ebook about color theory, but I found a really good dvd-course already is available. 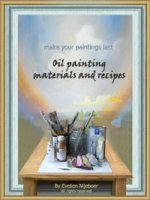 It's mainly focused on learning how to paint realistic (I'll recommend it here: www.livepaintinglessons.com). I've checked out the base-course, it explains color theory (and perception!) very well, with the help of great visuals (DVD) and a step-by-step tutorial. The biggest reason to get this course: the set of tools that help you learn to define colors and values in the first place. They're literally eye-openers. In result, you don't only learn how to paint a photo or landscape as-is, but also to stretch and change the colors without things becoming too unnatural. With this tutorial, you can expect to effectively gain your skills. There are three primary optical effects in color theory. The first is the shading of analoguous colors. In a prisma, you see colored edges, for example yellow-orange-red-burgundy. From yellow to burgundy the color gets ever darker. It's the prismatic way to go ever darker. Shading is about the way one color glides to another in a prisma - click here for more. Contrast is about the way colors call up their opposite. When you put a grey square on a green background, it will appear pinkish after a while. (green contrasts to magenta). When you see orange-brown brick with concrete parts in it, the grey concrete will start to look bluish. Interval is about: two contrasting colors calling up a third color - and not by mixing. This is not a very known phenomenon, but it works in perception just the same as it does in on an LCD-screen. Click here for more on contrast, shading and interval. When you have two paint colors that don't match: add one bit of color to the other, and vice versa. Always works. 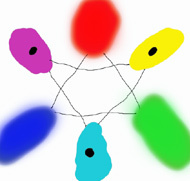 Using only three more or less primary colors to mix all your other colors on a painting, creates a unifying basis too. Use the layering effect to enliven or dull reds and blues (check here for more). Adjust the amount of colors in relation to each other can also be a way to prettify things. An accent color is added in small amounts,and a good base color can go on your walls. If you're looking for a hands-on approach to learn color theory from scratch: check out this DVD-course by Richard Robinson. I've checked it out - it's really good. All these tips were found in real life, but can be understood by a little color theory. Too much unity is dull too, but a hint to this unity being there makes an artwork or room just pleasant to look at. Just browse around on this website to find more of these tricks. I'm working on an ebook on color theory - I'll let you know when it's finished.